As commonly explained by experts, the law is the guidepost for minimally acceptable behaviour within society. The four principal purposes and functions of the law are to maintain order, resolve disputes, establish standards and protect the liberty and rights of the citizens. But it runs much deeper than that, and is often far more crucial than many expect it to be. Like many industries, law has been male-dominated for as long as it has existed but times are changing. Slowly, perhaps, but they are changing nonetheless. Not only are women receiving far more opportunities, but transformation within law is improving. BBQ magazine sat down with two young women who are not only making their way into the industry, but who are changing perceptions as they go. Rirhandu Matsala, aged 27, better known simply as Ria, grew up in the City of Gold in Ekurhuleni. Law wasn’t always the goal. Originally, Matsala wanted to become a Psychologist to help solve people’s problems, something, she says, she was very passionate about. She wanted to become the “Dr Phil of South Africa”. However, things changed in Grade 11 when Matsala had to job shadow. She had a stepsister who took her into shadow the legal advisors at the SABC legal department. The spark was lit that day and Matsala has never looked back. The spark still shines just as brightly as we sit and chat in her chambers. Law wasn’t foreign to Matsala either. Her uncle, Taki Madima, practices as senior counsel (SC) of the Johannesburg and Cape Bar and it was he who convinced her to come to Cape Town originally. “I studied at Tuks (the University of Pretoria) and completed my LLB degree there and then went on to do my articles, although I always wanted to be an Advocate, not an Attorney. So, after a year of articles, I swapped Johannesburg for Cape Town and applied to do my pupilage in the Mother City,” she explains. 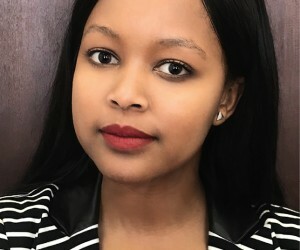 Matsala did her pupilage with her mentor, Mary-Anne McChesney, and wrote her bar exams in order to become an Advocate, which meant she could start practising, hold chambers and become a member of the Cape Bar. Those within or close to the industry will tell you how easy it is to get lost in it. The workload seldom eases, the hours are long and, as Matsala explains, often, when people are on Christmas holidays, you can find yourself in chambers with your head buried in all the papers. But, like with anything, balance is good. Balance is required. Balance is a necessity. Perhaps it is more the older generation who struggles to find the balance. And you can ask those who have fallen too deeply into the work—it has wrecked families, marriages and, in some cases, has led to far more severe consequences. Perhaps it is just the smile and charm of Matsala, but it appears that she has attained that balance. She speaks keenly about Cape Town being more laidback and less “cut-throat” than Johannesburg, which offers her more opportunities to relax and enjoy life. “Entering into this, I knew it would be a lot of work—I had seen my uncle in this environment. “So I expected it, but when I moved to Cape Town, I realised I could have a balance, I could still practice passionately and be hardworking and get the job done while, at the same time, telling myself it’s okay to take a break—I think this came from my mentor, Mary-Anne McChesney,” says Matsala. However, being successful in law is difficult. It isn’t glamorous and being a young black female doesn’t make it any easier. Transformation is as important as it is in any other industry, but the mindset within the country still remains skewed. Over the years, many of Matsala’s colleagues have shifted out of the industry due to the fact that they don’t get enough work, which mainly comes down to a mindset of black women and, in some cases, just women, not being good enough. “I don’t know if I have ever personally been overlooked because I am female or black but I believe if someone questions my ability for whatever reason, they should find someone else—the client needs to trust me and if they don’t, they need to work with someone they do,” she explains. Matsala has done well for herself, but she is not even close to achieving all of her goals. Many still lie before her, one of which is to one day open an NGO and offer disadvantaged kids the opportunity to achieve their goals, not only in law, but in whichever industry they choose. “The NGO will identify children from townships or disadvantaged areas who have the abilityto succeed and contribute positively to society, but their only obstacle is funding. “You see, bursaries are often handed out based on academic achievements but how can you measure a child accurately that has so many other issues to deal with? A child sometimes has to spend hours on the road just to get to school while others might not have a good daily meal, let alone three to go home to. “My NGO can then assist them financially while the mentor guides them through the process. My uncle currently does this at the University of Venda and I’d like to follow that example,” says Matsala. Masala explains that it is an expensive process to become an advocate. With an absolute minimum of five years, from matriculation to the day you can practice—and that is only if you pass every single year—she realises how lucky she was that her parents were able to assist her financially with her studies. One day, through this NGO, she would like to be able to give back to communities and those who are less fortunate. As far as career aspirations go, for now, Matsala is keen to remain practising in Cape Town and to continue improving as an Advocate. However, she would like to become an acting Judge when she has a few more years of experience and then, ultimately, become a permanent Judge. When Matsala isn’t making or breaking a case in court, she enjoys taking time out to simply relax with a good book and, perhaps more importantly, a good bottle of wine. With the time off that shedoes have, she visits her family, gyms or goes hiking up the mountain because “Cape Town has some great hiking trails”. We also sat down with an Attorney, Masivuye Sithole, who shared her experience of the industry and spoke about what she wants to achieve in future. Sithole’s story is one of hope. It’s a story that all too many South Africans can relate to—a story of perseverance and of overcoming the odds. They say fortune favours the brave and it certainly did in her case. Unfortunately, during her Grade 10 year, Sithole lost both her parents, which left her without the financial support to finish her schooling and follow her dreams thereafter. Her fortunes, however, changed again, as the school principal said they’d fund her final two years and one of Sithole’s teachers assisted in terms of applying to universities. UCT accepted. 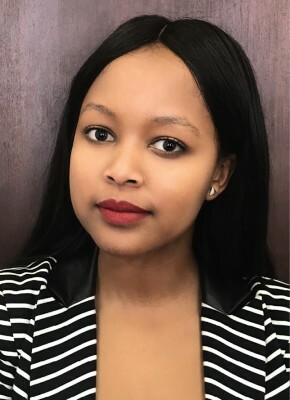 Sithole took the route of becoming an Attorney rather than Advocate and currently works for Van Wyk Simpson Attorneys in the Waterfront, Cape Town. “It has been quite a huge transition, going from being an articled Clerk to being an Attorney, because, now, you are accountable; you don’t have your Principal as your buffering person, you are the centre point for clients. However, it is a challenge and I love a challenge, I’m really enjoying it thus far,” she enthuses. Becoming an Attorney was not always the goal for Sithole. Initially, she was not sure what she wanted to do, despite having a bit of background in law—her father was a Magistrate in the Eastern Cape. So, when she went to UCT, she signed up for a general BA degree “but I ticked the law option for second year in case I became bored”. Clearly, Sithole did become bored because, in her second year, she went into law and, clearly, she has not looked back. However, it isn’t all roses. She says that being a female in the industry is not always easy, as much of the profession is still stuck in archaic ways. “Before, I didn’t think about it much but now, as an Attorney, I have started to realise that some people speak differently to you, as though you need things to be explained in simpler ways. They speak differently to how they speak to your male counterparts—it is almost as though you constantly need to prove yourself, ”Sithole explains. While transformation is important, Sithole believes it isn’t just about black versus white, it is more about male versus female. People, for some reason, seem to believe that, perhaps, men hold more weight in court, or can do a better job, which is obviously not the case. But that’s the prevailing mindset amongst many people. Things are changing, however, and Sithole believes that things like Mandisa Maya, a lady from Umtata, becoming the President of the Supreme Court of Appeals can only help. Sithole says that it is easier to be shifted out of the industry when you are an advocate because you are not getting business and you work for yourself, but she has seen many female attorneys go off and start their own firms, such as Mary-Faith Saku did with Saku Attorneys “so you have to believe in yourself and be bold”. Sithole is thankful for the sacrifices that were made for her in order to achieve what she has today. She worked hard but also received assistance along the way. She is grateful to her mother, who sent her to boarding school because the matric pass rate was so low at their community school, and this is where she learnt reading, understanding and the correct pronunciation of words. The life of an attorney is a busy one but just like Ria, Sithole realises that creating a balance is key to a healthy life. Although she doesn’t have much free time, she enjoys spending time with her family, going on hikes, reading and, generally, finding space, away from the city, and breathing in the clean, fresh air. She also has a great love for dogs. Being a young Attorney is tough, but if her life is anything to go by, it will be a success and, in a few years, we might see Sithole on the bench as an acting Judge. However, more importantly, and what really lights her eyes up, is starting the Shine Literacy programme in her home village. For now, we will enjoy watching from the sidelines and we look forward to everything she has to offer.